I have truly learned a lot in the last 5 years of marriage. Today being our 5 year anniversary I would like to reflect on some of those things. 1. Choose your battles. Not everything is World War II material. Initially I would have a rally, march, injustice speech, ‘i have a dream…’ speech about any and everything under the sun. Basically I learned not to nit pick about everything. 2. Do not end, begin, think, consider, or even dream of a sentence saying what your mom did/does that she doesn’t do. If she doesn’t make cornbread like your mother; learn to love the new cornbread in town. If you truly need that fix of cornbread so bad than stop by your moms and ask her to make it. But I found out quickly that comparing your wife to your mom is extremely bad for your health. It’s marital suicide! 3. Choose your words carefully. What can I say. I was young and dum…..lol! I’ve said plenty of stupid and tasteless things I cannot take back. And that’s the problem with being quick to speak. You do not need to verbalize every single thought you have. If you decide to verbalize at least half of those thoughts, then make sure you use tact. Do not intentionally say harmful things. Because those words can last forever. Those words can not be taken back by purchasing her a bigger ring, but it’s a good start. 4. You can’t be right all the time. Matter of fact, you can if you’d like to slowly choke the life out of your marriage. I had the uncanny knack for deliberating a case until I turned blue. It gets you no where. It’s like moonwalking. You may think you’re moving forward but you’re slowly digging yourself a grave, backing into it, & shoveling the dirt on top of yourself. Sometimes you can be right in your head and be just as happy. 5. Listen. If the lips of your spouse are moving and all your hear is the Charlie Brown ‘blah blah blah blah blah’. You’re failing. Do you like to be heard when you are speaking to her? It definitely goes both ways. Fortunately this was not one of my weak points. 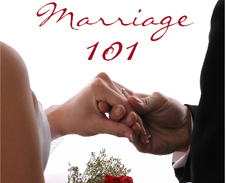 These are definitely not the only things to know in marriage; you learn more as you go. Marriage is what the two of us/you make it. Make it a wonderful experience. Love aggressively. Reminisce on the things you all have done together often. And constantly prep yourself for an even more amazing future.